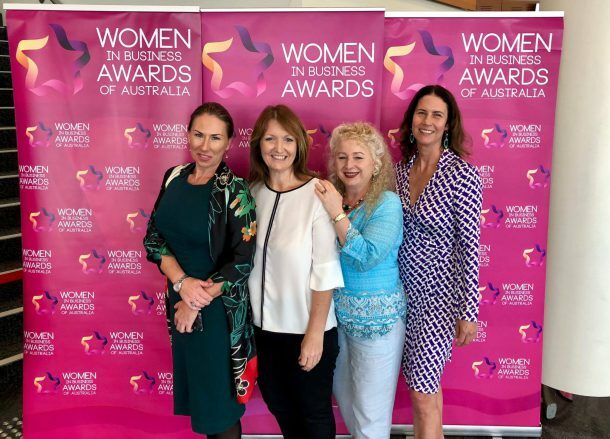 Our founding Directors, Judy Robinson and Terri Sheldon were finalists in the Gold Coast Women in Business Awards Creating Change category this year. A big congratulations to them both. Judy Robinson has been registered as a Psychologist since 1989. She is also a full member of the Australian Psychological Society. Seventeen years ago, Judy co-founded, and remains a Managing Director of The Lakeside Rooms – an integrated multidisciplinary private mental health clinic. This model of service delivery has international evidence accumulating in outcomes for mental health. The clinic offers a highly reputable supportive space for psychologists and psychiatrists (at various times in the past we have also had speech pathologists, mental health social workers and occupational therapists). It offers the opportunity for mental health clinicians to collaborate whilst maintaining independence in a supported practice. Judy provides service delivery support, referrals, mentoring and supervision to many of the psychologists here at Lakeside. Judy also provides clinical supervision to master’s level psychologists who have achieved clinical college membership and associate supervision to clinical doctorate students. This placement program was part of an arrangement between Lakeside Rooms and Griffith University Externships to afford students the opportunity to have a mental health private practice placement in a highly supported environment. Terri Sheldon has been registered as a Psychologist since 1985. She is also a full member of the Australian Psychological Society. Seventeen years ago, Terri co-founded, and remains a Managing Director of The Lakeside Rooms – an integrated multidisciplinary private mental health clinic. This model of service delivery has international evidence accumulating in outcomes for mental health. The clinic offers a highly reputable supportive space for psychologists and psychiatrists. Terri provides service delivery support, referrals, mentoring and supervision to many of the psychologists at Lakeside. Terri also provides clinical supervision to Bond University master’s level psychologist. In the clinical research field, Terri has recently been co-investigator in a world first randomised clinical trial investigating the impact of Emotional Freedom Techniques (EFT) in the treatment of food cravings in overweight and obese adults. She is also currently a co-investigator with Dr Peta Stapleton at Bond University in the Treatment of Unhealthy Food Choices and Consumption for Overweight Children aged 12-18 years; and EFT versus CBT for Depression in Adults: A Randomized Controlled Trial. Further, she is also a research co-investigator in the “Heart and Mind Study: Exploring the link between heart disease and depression” with Dr Chris Stapelberg, Psychiatrist, and Griffith University.